You are 2 months old as of yesterday! Where is the time going? I think it's going into your tummy as it is very cute and round. At your checkup we found that you weigh 15 pounds already! And you are 24.5 inches long. Such a big boy. 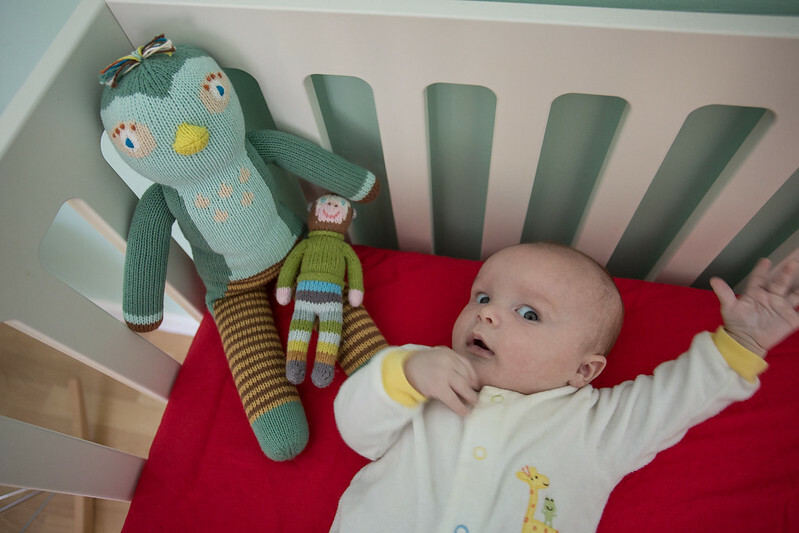 You are wearing 6-month sized onesies and it's just all going too fast. You continue to be so sweet and gentle and you have the most wonderful smiles around. Cuddling with you in our middle of the night rendezvous (your meal) is such a treasure for me. It's quiet and warm and snuggly...just the kind of feeling I want to remember for always. I look in your eyes and all I see is love and possibility. I love you always and forever my sweet! "Hey Figaro, (loud whispering voice) That crazy lady keeps lookin' at me and takin' pictures! What's her freakin' deal?" 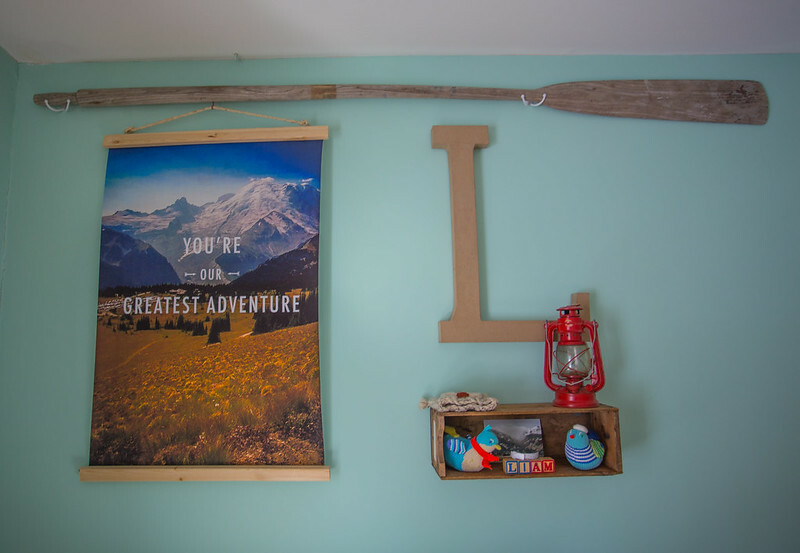 Liam's Baby Boy Adventure Nursery! 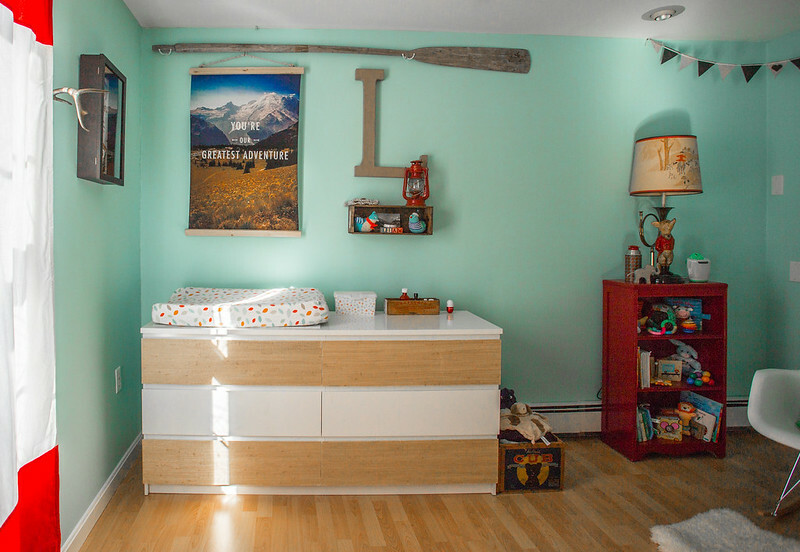 We finally finished up Liam's room just after he was born...I'm sorry it took so long to share his space! Juggling three kiddos is no joke; I don't know how people with do it with even MORE! I am in "go-mode" all day until bedtime just with household tasks and childcare. Phew! I have to add, though, that it is a fulfilling kind of tired and I feel so happy these days. 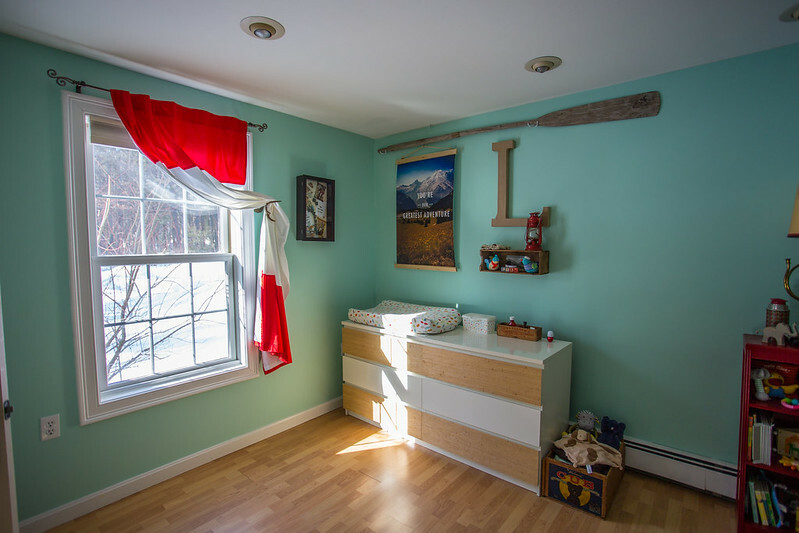 So, this is Liam's room and I hope you like it as much as I do! As you can see, it's an eclectic mix of items that come together to form a sort of vintage adventure/into the wilds theme. 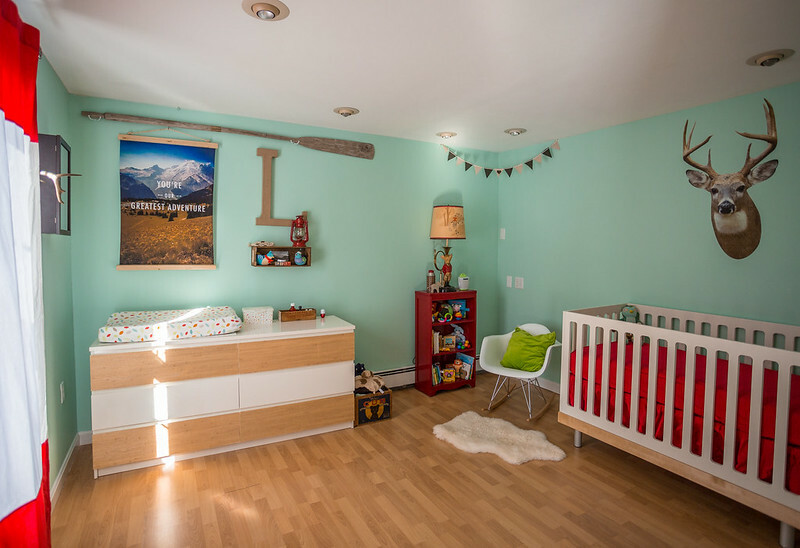 I chose to use the same Robin's Nest blue color (#618 from Benjamin Moore) that we used in the other kids' nurseries because it's such a happy color and so versatile. 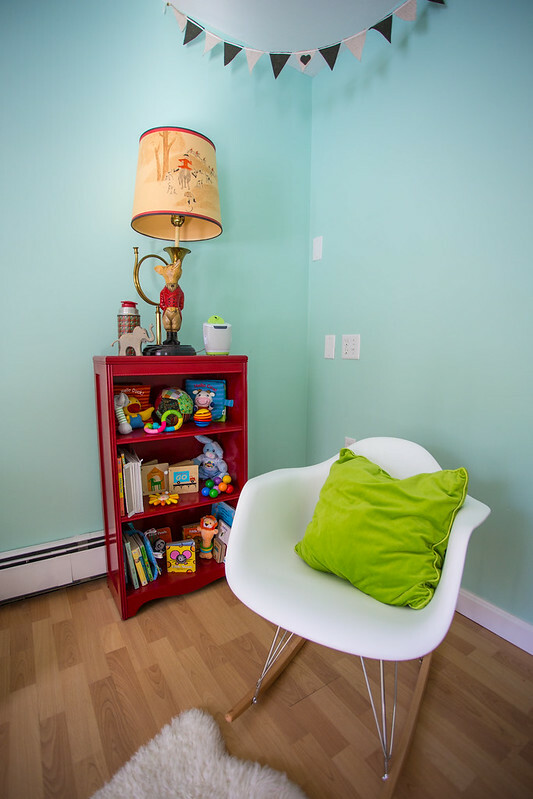 Paige's room had a yellow accent, Noah's had an orange accent, and Liam's now is a red accent. 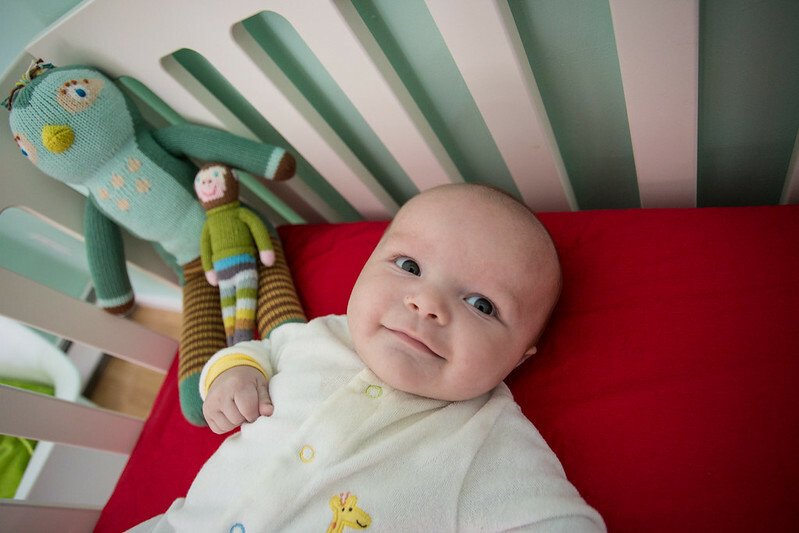 We also used the same crib and dresser the other kids used (recycle it!!!). Liam's room is a bit smaller in this new house than the nursery was in our old home, so we couldn't put as much stuff in here--no giant Ikea Expedit shelving for this room! But instead we used a bookcase we had on hand that I spray painted red (it used to be aqua). 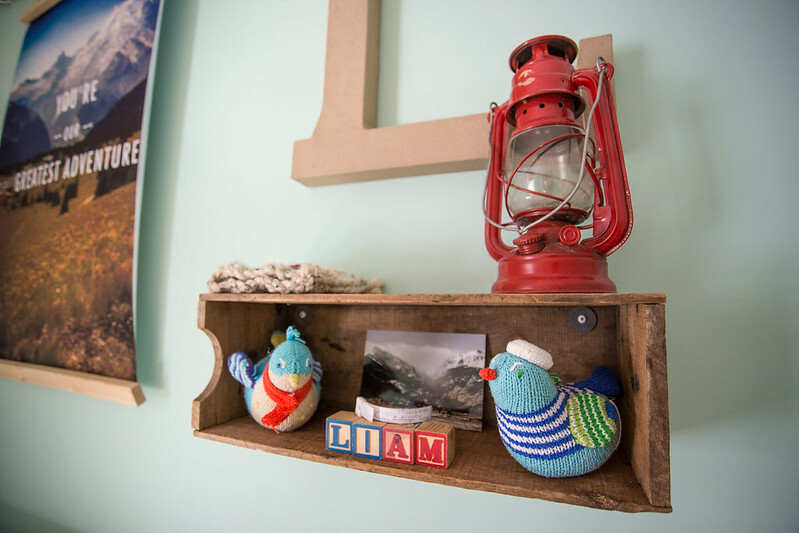 Here you can see we hung up a vintage wooden drawer from some sort of old manufacturing storage unit to be used as a decorative shelf. Inside we put some knit rattle-birdies (they came from Bla Bla Kids years ago), some vintage alphabet blocks we got at the Spaulding Cooperage (a local coop that sells reclaimed/refinished furniture and vintage goodies), a black and white postcard of a mountain range a friend gave me, Liam's hospital anklet, a vintage camping lantern I got from my friend Becky at her business "Box 121 Antiques," and a little knit owl hat Liam got as a baby gift. 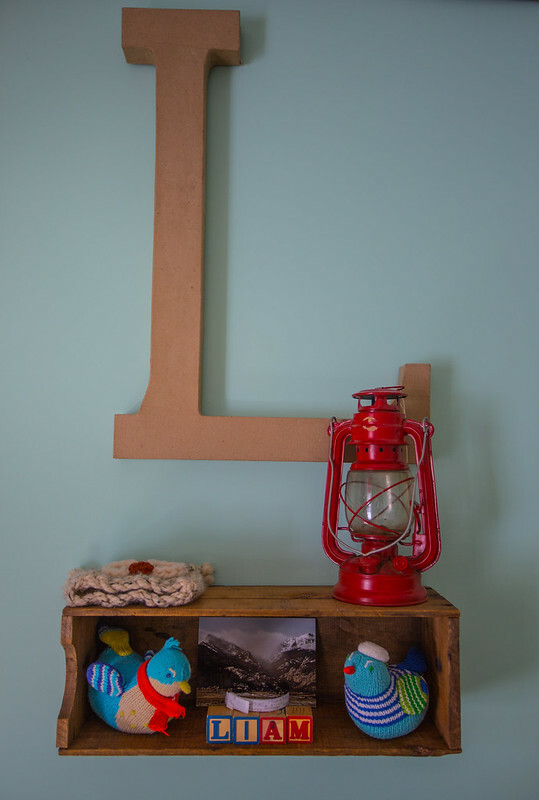 The huge kraft letter "L" hung on the wall came from Plum online boutique. That is such a cool little shop!!! Check it out! I considered painting the L a red color, but decided it looked more rugged and "vintage" just as it is. 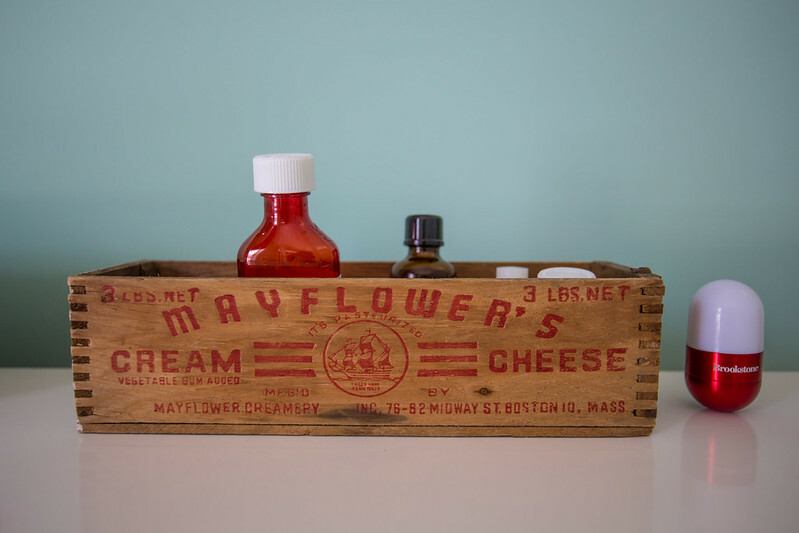 This little vintage wooden box sits on the dresser top...it's a nice little place to store some medicines and the lavender oil I like to rub on Liam's baby skin. (Baby skin!!! SIGH!!!!!) I got this from my friend Kris of Cricket Acres Studio. 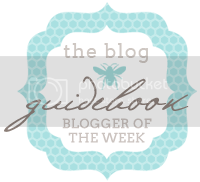 She is forever finding the coolest and most unique vintage items for the home and she has a really great way of re-purposing those things into cool new products.She has an inspiring blog too. My friend Becky at her business "Box 121 Antiques," also sold me that rustic old oar that I decided to hang as wall decor. I thought it would be cool to create a vintage-looking poster for the room. I knew what I wanted it to look like and say, but I couldn't settle on a design. Then, a few days later, I found this post from Joni at Lay Baby Lay and went wild. That was exactly the look I wanted for my poster! I simply followed her instructions and it worked like a charm. She's a genius, that one! I then saw this post of her's and used this look for my own poster (it was the exact look I'd been planning!) She has her own poster for sale in many sizes here, so check it out! (Mine is not for sale since it is her design look...though not exact). Also, the photo in my poster is of Mt. Rainier that my friend Laura and her husband took. She generously let me use it for my poster. I changed the look of it in Photoshop to give it a vintage look to the colors and then I brought my poster design over to Staples to have it printed large. Becky sold me this really cool vintage fruit/orchard crate...I love the colors and the label and knew I had to have it for the nursery. I intended to put casters on the bottom to make it roll, but I'm thinking better of it as the kids would try to ride around the house in it (thus scratching our wood floors) and the box itself is fragile. 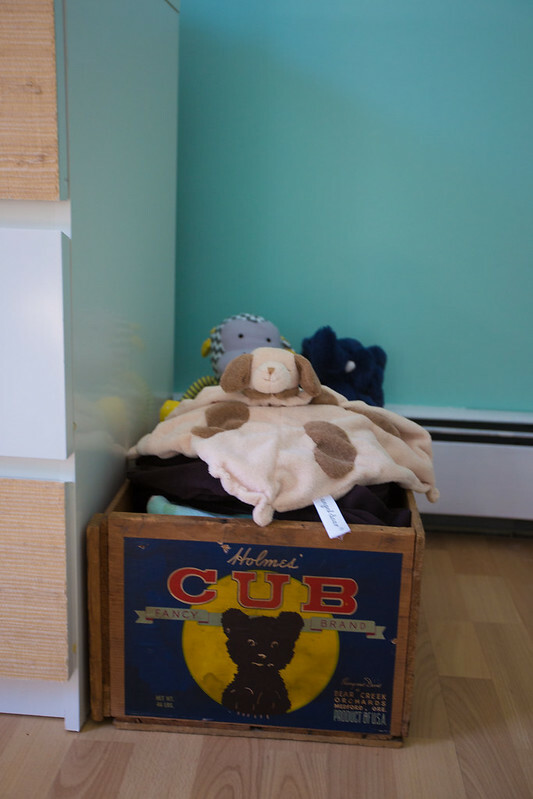 So, for now it is storing some baby blankets and soft toys. On the wall next to the dresser is this really great shadowbox art display my friend Shenna of Shenna's Vintage Creations gave me. 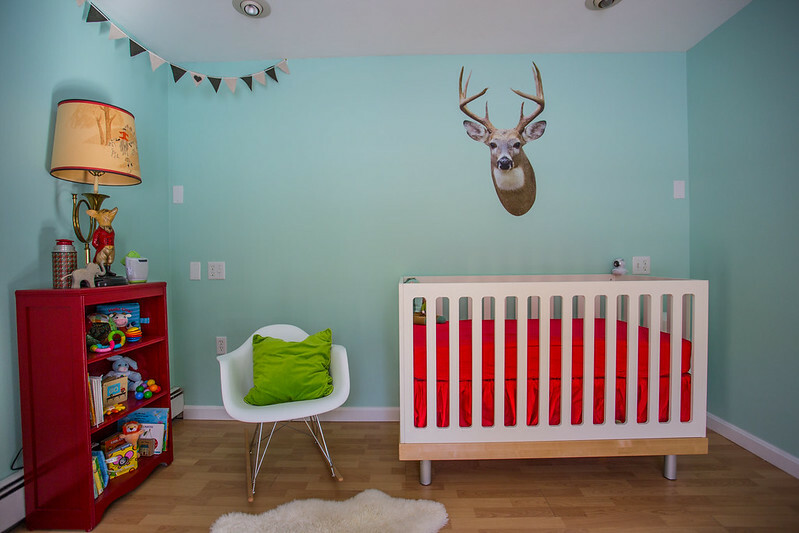 She made it herself to match the theme of the nursery and I simply need to add photos of Liam to make it complete. Isn't it cool? 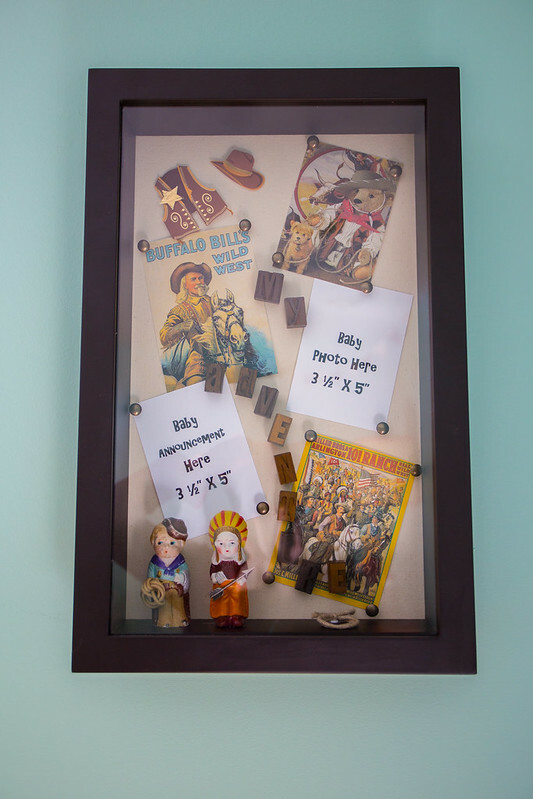 She can make these in customized themes (she recently made one in a vintage Winnie the Pooh theme using a vintage children's book and other found props). It opens on the side like a cabinet so I can move things around as needed. 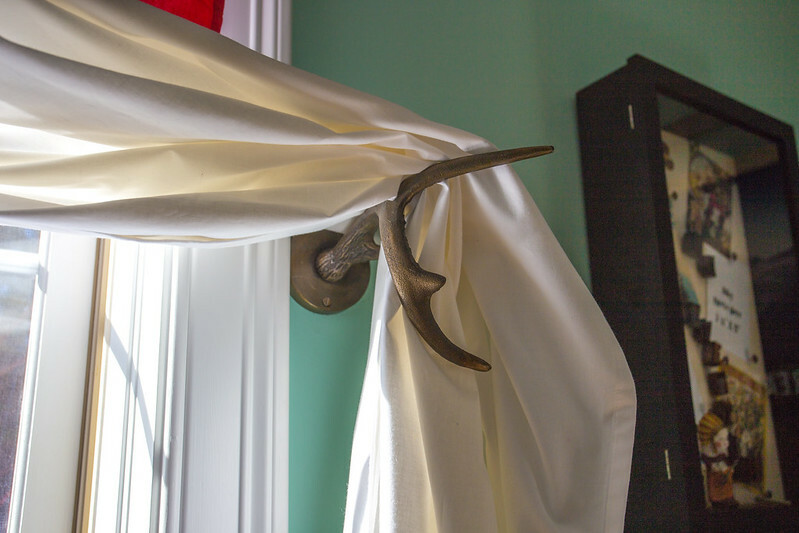 This metal antler curtain tie is just a fun and whimsical touch in the space. We find, though, that it is a bit dangerous...it's heavy and sharp-ish. That's why we hung it up high. We don't want anyone to lose an eye. It came from Urban Outfitters. This is such a fun corner! This is a knock-off Eames-style rocker I got from Overstock.com. The little sheepskin is from Ikea and the pillow is from Pier One Imports. The antique fox lamp was in my husband's childhood bedroom and I asked my wonderful in-laws if we could have it for Liam's room. It matched the theme and colors so well. It also has a really cool hand-painted shade. I love it! My friend Kris made the bunting as a gift...it's boyish, simple and sweet. These little guys are from BlaBla Kids. I love their products...they are well made and the color combinations are so perfect and fun! Figaro the bird watches over the space and keeps everyone in check. 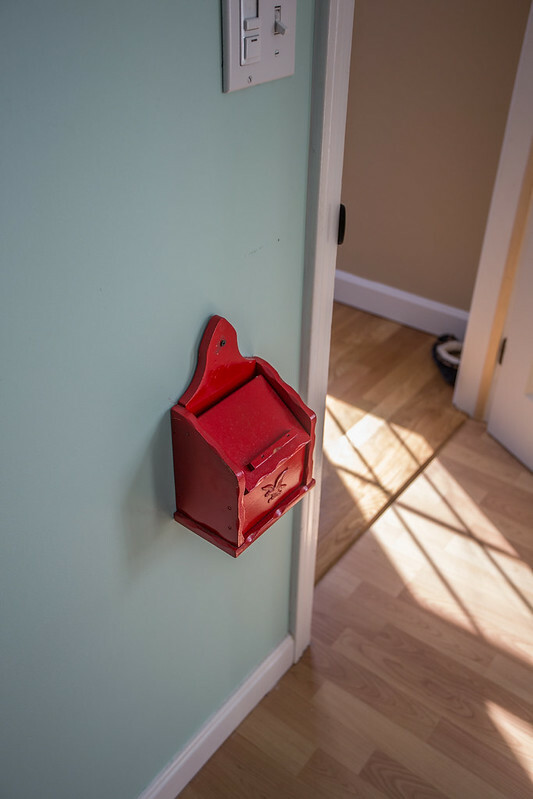 Finally, I got this little red vintage mailbox from the Spaulding Cooperage as well. I thought it would make a cute little wall decoration. We hung it down low so the kids can put little trinkets inside and exchange messages to each other when they are a bit older. It's a bit of a nod to my obsession with Little Women and their secret mailbox with Laurie next door (any fans will know what I mean!). So, that's the space! I'm still tweaking a bit here and there, but I love being in that room. It's bright and happy and that's just how I feel with Liam. I hope you liked it too! 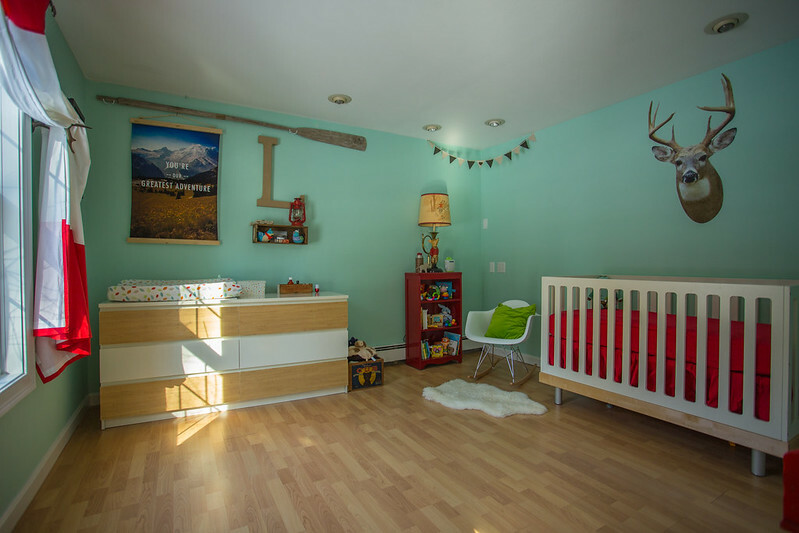 And, for a flashback, here are the posts I had done for Paige's nursery, and for Noah's nursery. I also made a little video tour if you are interested in watching!!! Thanks for stopping by!!! Who pooped on the stairs?